A collection of actions that make working with files in the mobile device file system easier. All PhoneGap file system actions are asynchronous. When you define any of these actions you specify a success function that gets called once the PhoneGap action has successfully completed. Specify the File System Action that you want to perform. Creates a directory in the mobile device file system. Deletes a directory from the mobile device file system. For example if you specify 'dir1/dir2' as the name of the directory to remove it will remove 'dir2'. See also the Remove Directory Recursive action which removes directories recursively. For example, if you specify 'dir1/dir2' as the name of the directory to remove, it will remove both 'dir1' and 'dir1/dir2'. Removes a directory recursively. For example, if you specify 'dir1/dir2' as the name of the directory to remove, it will remove both 'dir1' and 'dir1/dir2'. Creates a new text file. The filename can include a full path (e.g. dir1/dir2/file.txt). The directory structure for the target file must exists. After the file has been created the onSuccess function is called. If the file was not created, the OnFailure function is called. Deletes a file. The filename can include a full path (e.g. dir1/dir2/file.txt). After the file has been deleted the onSuccess function is called. If the file was not deleted, the OnFailure function is called. Checks if a file exists. The filename can include a full path (e.g. dir1/dir2/file.txt). The onSuccess function is called if there were no errors. Your onSuccess function can reference the 'flagExists' variable which will be true (file exists) or false (file does not exist). If there was an error in trying to check the file, the OnFailure function is called. Reads a text file. The filename can include a full path (e.g. dir1/dir2/file.txt). The onSuccess function is called if there were no errors. Your onSuccess function can reference the 'data' variable which will be the file contents. If there was an error in trying to read the file, the OnFailure function is called. Gets the URI for the legacy persistent file system. 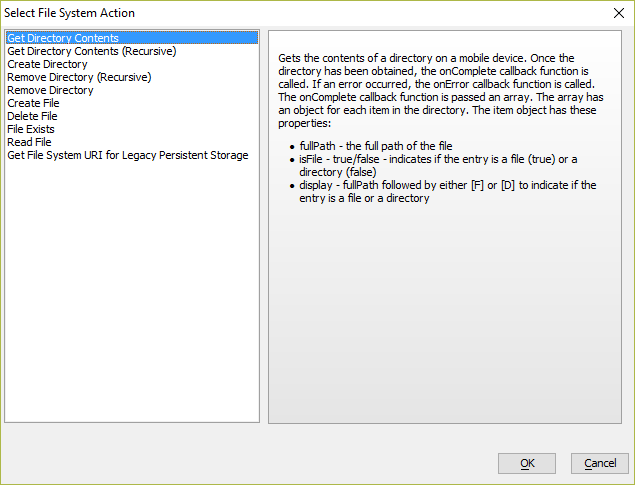 All of the actions defined in this builder use the Legacy Persistent File Storage location. If you want to use the newer PhoneGap - File System Actions (File URI Based) to work with any files or directories created by the actions exposed in this genie you will need the URI of the legacy file system.